As the current head-guide for the Spatsizi Lodge I can honestly say this is an unbelievable fly-in only mecca for dry fly sipping Rainbow Trout, monster Bull Trout, and beautiful Arctic Grayling. When you fly fish in one of the most beautiful and pristine environments on the planet catching fish is just a bonus. Visit www.spatsizi.com for more info. 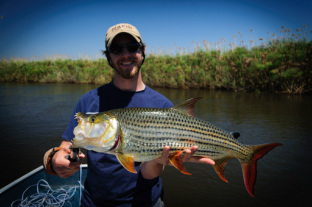 The Okavango Delta in Botswana is where my fly-fishing career began in 2008. With 4 seasons of experience targeting tigerfish on the Okavango Delta I can attest that this is definitely a bucket-list fly fishing destination. Pairing this incredible fishing experience with a multi-day photographic safari and a trip to world renown Victoria Falls makes for an excellent African experience. Customized packages available on request. Contact me for more info.